Back on the League One treadmill. Over 6,000 miles to travel this season, most of them to the frozen north, but I’m actually looking forward to it, masochist that I have become. That’s what an hour in the company of chairman Darragh MacAnthony does to a man desperate to believe the hype. The salesman supreme managed to convince me that a host of signings with no League One experience, the arrival of an ex-Premier League defender who would be treated as a huge transfer coup if he wasn’t so injury prone, the determination to play with wing-backs even though the squad lacks anyone with experience of such a specialist role, the departure of the club’s reigning player-of-the-year and defensive rock, the loss to a rival from the same division of the best Posh goalkeeper I’ve seen since Ian Bennett, and the sale of last season’s top scorer (even though the chairman appeared to be his biggest fan) won’t inconvenience a promotion push. (Actually scrap the last point, Tom Nichols is a lovely chap, but he never convinced me he was really up for a battle). One thing’s for sure. If Posh do pull off promotion it would be the greatest achievement of the MacAnthony era. The last time League One was left behind they had proven performers in the division, including Grant McCann who now enters the crucial second year of his managerial career. It’s emerged that McCann’s debut season was riddled with off-field issues. If so, and I have no reason to doubt the veracity of the claim, he hid it brilliantly. I’ve never wanted a Posh manager to succeed so badly as I have McCann. His love of the club is not fake and I suspect he’s shrewd enough to have learnt from the mistakes of last season when a fixation with the midfield diamond and poor substitutions were costly at times. Do I think Posh will win promotion? Not really. Only three of 24 teams are successful every season. It’s a terribly difficult thing to pull off and luck with injuries and form is essential. A huge following wind is required. There will be no outstanding team of Sheffield United’s ability this season, but I suspect the general standard will be higher than in 2016-17. The likes of Blackburn, Wigan and Charlton will see themselves as too good for League One and will push accordingly. The promoted teams won’t struggle this season and I wouldn’t be surprised to see Portsmouth achieve back-to-back promotions as they could well have the best manager in League One in Kenny Jackett. I’d settle for being entertained while Posh push harder, for a bit longer, for the play-offs and the signs are good in that respect. 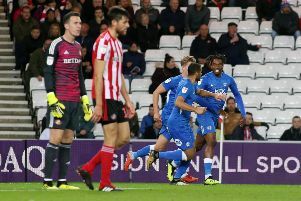 The strikers will be sharp and quick this season and if Steven Taylor’s body holds up, Posh might well have the best defender in League One on their books. We all wish Posh well. Gwion Edwards will be the club’s player-of-the-year, whether he plays as a left wing-back or as an attacking midfielder. Marcus Maddison will enjoy the best season of his career, but sadly for a different club. Chairman Darragh MacAnthony will reach 60K followers on Twitter and ‘kill’ his 60,000th troll. Jack Marriott will score 20 League One goals. Posh will be playing a 4-4-2 formation by the middle of September. Grant McCann will sign a contract extension at Christmas. On January 2, Barry Fry will tell the media that Idris Kanu is worth £5 million.